General impressions of the album/book: One Hell of a good read! Specifics: There are 22 stories in this collection. I couldn't find a dud in the entire volume. Packed with memorable characters in unique situations, each writer brings something different to the “Heroes In Hell” shared universe. There is something here for every reader. This volume focuses on courtroom proceedings, as one would guess from the title. 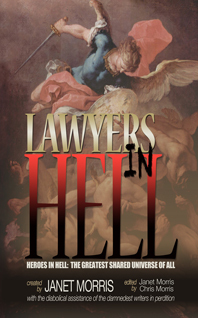 Historical characters from every era find themselves facing not only eternal damnation, but a hellish court of law. The writing is excellent, tight, gripping, and hypnotic. I found myself racing through each story, yet reluctant to turn the next page for fear of reaching the end of the book. Every writer shows a polished, smooth style that lends itself easily to the charactization of each and every actor upon this literary stage. With so many writers contributing to the work, one would be forgiven for believing that there would have to be an easy favorite, or least favorite, story. But one would be wrong. By the last page, the reader will want to search out other books in this series. It really is that good! This is a series you will want to collect. Each and every volume is well worth hunting down and adding to your library. Background info: Since this is an anthology of short stories, I'll skip my usual practice of giving a short biography of the writers.